Allium cepa ascalonicum, or shallot, is a common bulb found in French cuisine that tastes like a milder version of an onion with a hint of garlic. Shallots contain potassium and vitamins A, B-6 and C and grow easily in the kitchen garden, either by seed or more often grown from sets. Like the garlic, each shallot bulb yields a cluster of 10 or more bulbs. Pricey in the grocery store, planting your own shallot sets is a cost effective way to enjoy the alliums for many years to come. Okay, so what are shallot sets? Keep reading to learn about shallot set growing. When planting shallot sets, consider that shallots are classified into two groups: pear-shaped (the French type) and round. The color of each variety will run from white to purple with the flavor varying depending on type of shallot set, weather and growing conditions. A shallot set is a grouping of small individual shallot bulbs generally purchased from a nursery. A 1-pound shallot set is enough to plant a 20-foot row, although the number of bulbs will vary. This 1-pound shallot set will yield 10-15 times as many mature shallots. Shallots can grow in USDA zones 4-10 and should be planted in early fall. Shallots can also be planted via seed, which will cover a larger area more easily and cheaply than shallot sets. 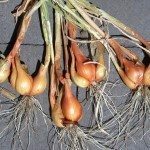 However, given the large number of shallots reaped from just one set (see above) and the longer growing time when planting by seed, most of us will choose planting shallot sets. 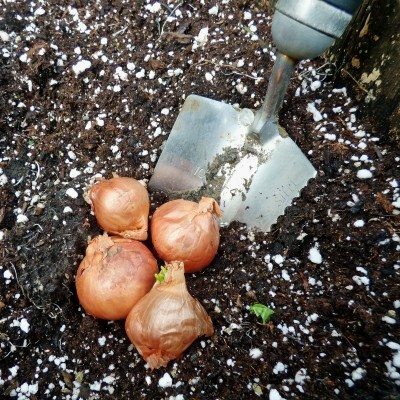 To plant shallot sets, separate the bulbs and plant individually in fall, four to six weeks prior to the first freeze. Shallot sets may also be planted in the spring two weeks before the last frost. Fall shallots will be larger and ready two to four weeks earlier than spring planted sets. Before planting the shallot set, prepare the garden as you would for onions or garlic by creating a well draining raised bed amended with compost. Plant the shallot sets in full sun, and in soil with a neutral pH. Akin to onions, shallots are shallow rooted so the soil should be kept evenly moist and weeded. How Deep Do You Plant Shallot Sets? Given that these alliums have short root systems, the next question pertaining to root depth is crucial. Plant the shallot sets 6-8 inches apart and 1 inch deep. Both the round and French type of shallot will produce 1-2 inch bulbs and should be fed with 1 pound of a 5-5-5 fertilizer per 10 foot row. If temps in your region drop below 0 F. (-18 C.), cover the fall planted shallots after the first freeze with 6 inches of hay or straw. 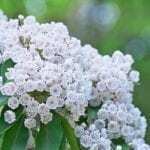 Remove the mulch in the spring when new growth appears and side dress with a 1-2-1 ratio fertilizer in the amount of 1 cup per 10 foot row. The young shoots of the shallot sets can be harvested as green onions when they are ¼ inch in diameter, or when the tops naturally die back and brown, for more mature shallots. If you decide to wait, reduce the watering schedule a few weeks prior to allow the bulb to form a protective skin. After harvesting, separate the bulbs and dry them in a warm (80 F./27 C.), well ventilated area for two to three weeks to allow them to cure. 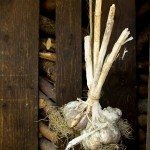 Then, just as with garlic, braid the dried tops together or lop off and store in aerated bags hung in a cool, humid area like an unheated basement. Shallots are rarely bothered by pests or diseases. Fall planted shallot sets result in stronger flavored bulbs as does any stress such as heat or lack of irrigation. Flowering on shallot sets is usually an indicator of such stressors and should be snipped off to allow the energy of the plant to be used in bulb production. Save a few of the sets for replanting in the fall or early spring and your initial investment will keep you in shallots for years to come.